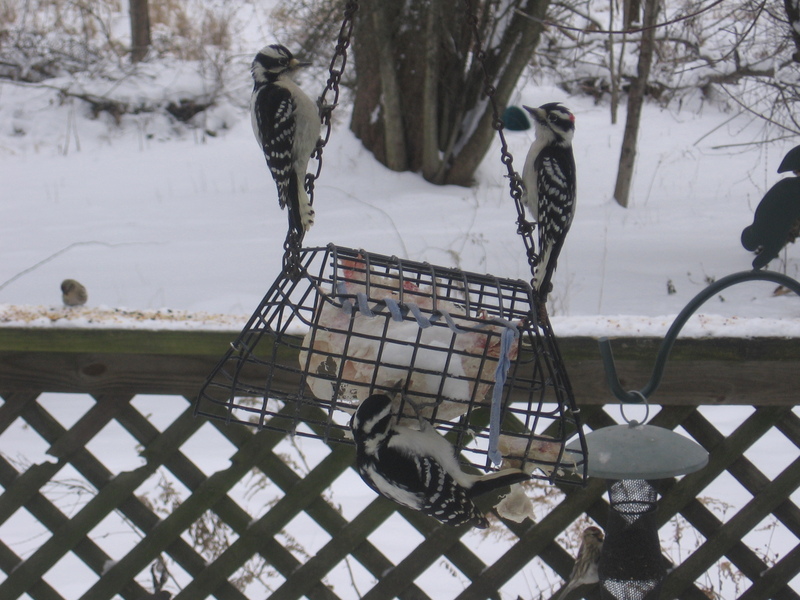 Anticipating the first chilly morning, I filled all my feeders last night. I’m glad I did. Among the usual suspects at breakfast buffet, I saw this eccentric fellow. 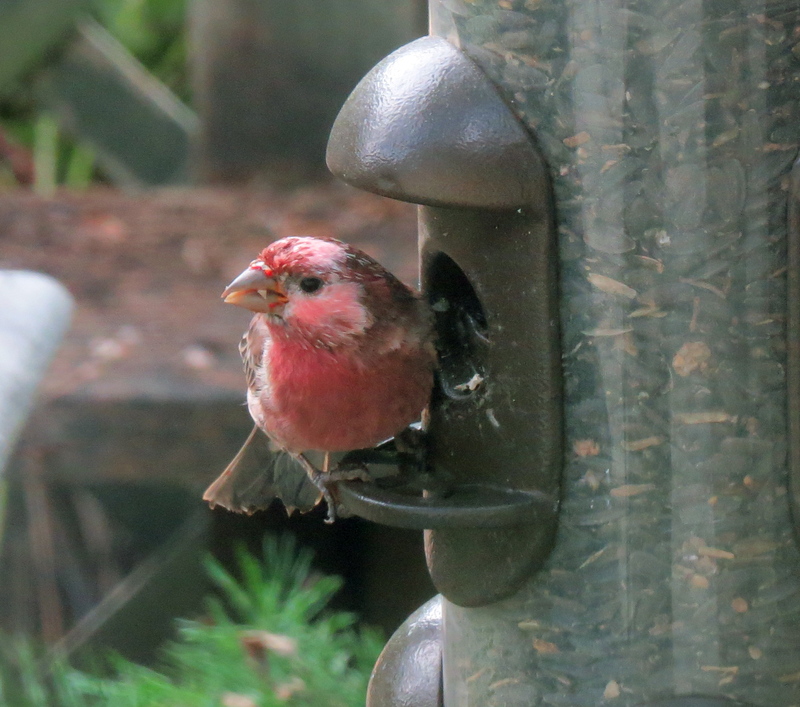 It’s a partially leucistic House Finch. I’m always looking for leucistic birds, but this is the first time I’ve been able to get a photo. A few years ago an American Robin with ‘racing stripes’ – white feathers in its wings – visited the yard for a day, and I’ve seen mottled Robins on the Cornell campus. There’s a stunning white Red-tailed Hawk (frequently mistaken for a Snowy Owl) in the area, but it often hangs out on the I-90 bridge when I’m zipping past at 60. Maybe someday I’ll be fortuitously stuck in traffic! Browse through Google images for leucistic birds and delight your eyes. Common birds, many of them, made stunning by a chance mutation. Of them all, my favorite is the calico red-winged blackbird seen by Nancy Nabak. So, you’re feeling confident in your bird ID? Greater/Lesser Yellowlegs, first-winter Blackpoll/Bay-breasted Warbler, worn-plumage Sparrows no challenge anymore? well, my young Padawan, do I have a bird family for you. But what do you do when they don’t call? That’s the puzzle we faced today at Mosher Marsh, a wetland preserve near Amsterdam, NY. This empid flew to the top of a shrub and posed for us. And our International Bird of Mystery sat in the middle, saying nothing. At length we gave up the struggle, entering on our trip list the admission of defeat: Empid Sp? An air of mockery followed us in retreat. … or, how the internet helps me bird better. Fortunately for my sanity, by 10:45 the bird was gone away. Even if I’d torn up the highway at 10:02, I would have missed it. Here’s an account and picture by one of the lucky few to see this rare visitor. Instant reports, instant photos — just a few years ago, we depended on the local bird line to inform us, five days late, of notable sightings. If we were lucky, the eyes in the field could dash to a pay phone to start the phone tree. Today, someone saw a Willow Ptarmigan* in Jefferson County. Within an hour, the report was on a dozen rare bird lines. An hour later, photos. Two hours later, GPS coordinates exact to the bush. More pictures, plans to carpool from Long Island and NYC and Buffalo, comparison to a Ptarmigan seen in Montreal during the winter, historical records — information I wouldn’t even know to look for pouring forth. How did I get so lucky? Even though I knew the odds of the Gyrfalcon returning were beyond long, it was a nice enough day-after to warrant a trip upriver. With all the binocs focussed up there, some other good birds had been detected — a Golden Eagle, a Tundra Swan — and with the winter finally broken a few migrants might start wandering up. The flooded fields at Wrights’s Loop were predictably ducky and the trees were screaming with icterids, a few of them Rusty Blackbirds. This once-numerous species has been in serious decline for decades, no one knows why. Along the river, fewer ducks but more species. The dabblers had all arrived. The huge rafts of Canada and Snow Geese had dispersed. 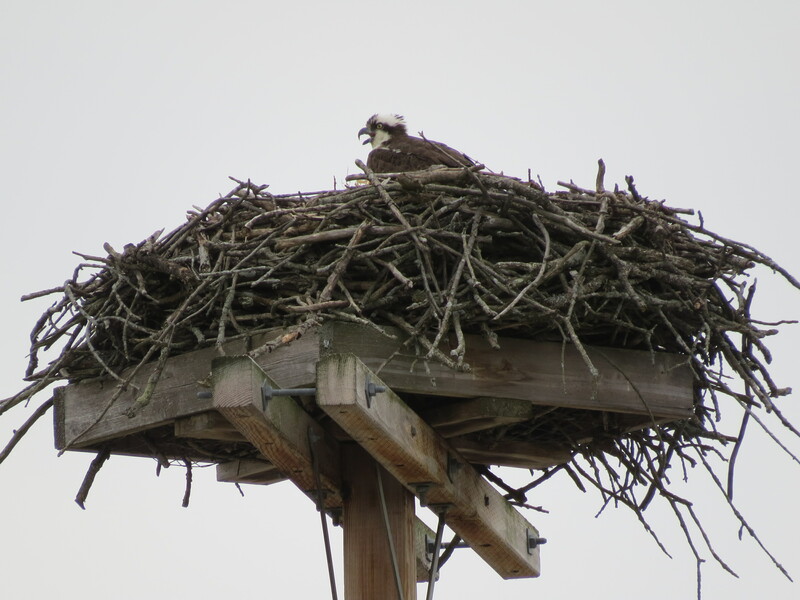 And the Osprey pair were back to their nest. 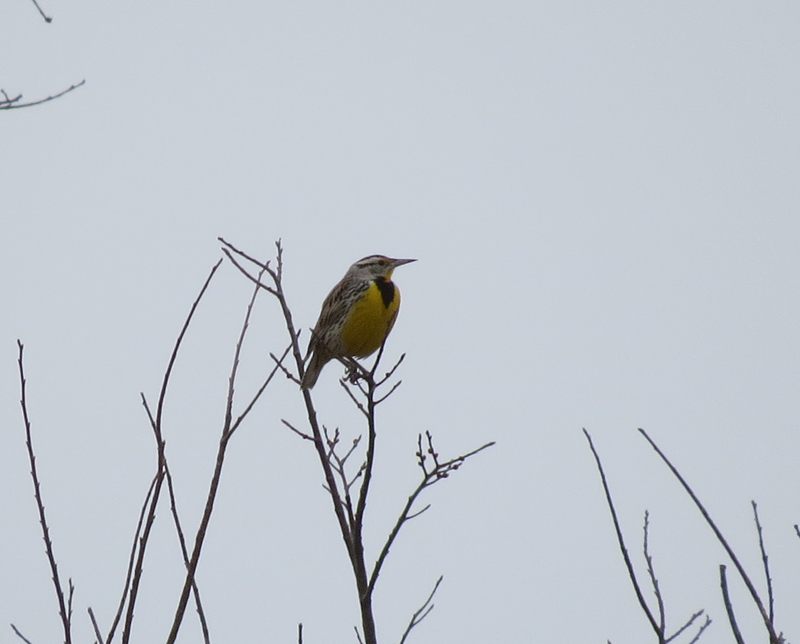 Entering the grasslands, I rolled my windows down and was delighted by an Eastern Meadowlark in song. 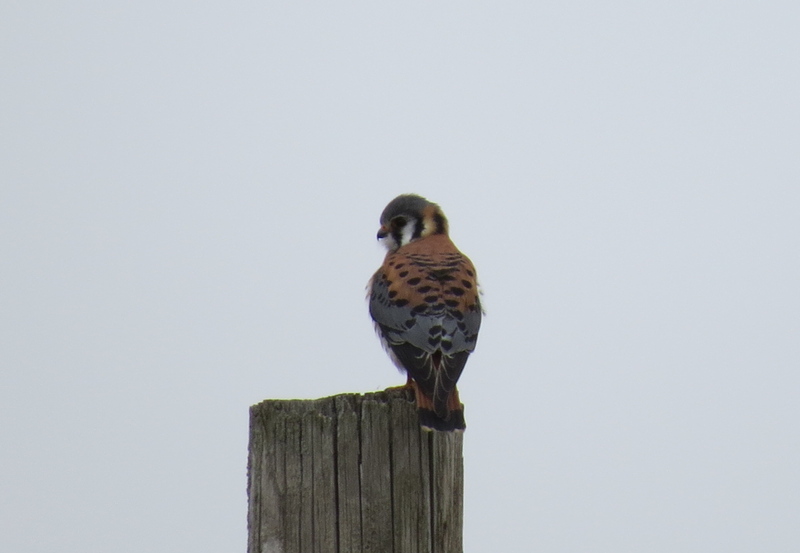 I counted five of my darling Kestrels along the way. A species of special concern, indeed. I tried to turn every pair of heavily flapping wings and slight dihedral into the previous day’s Golden Eagle, but they were all Turkey Vultures laboring against the lack of thermals to glide on. 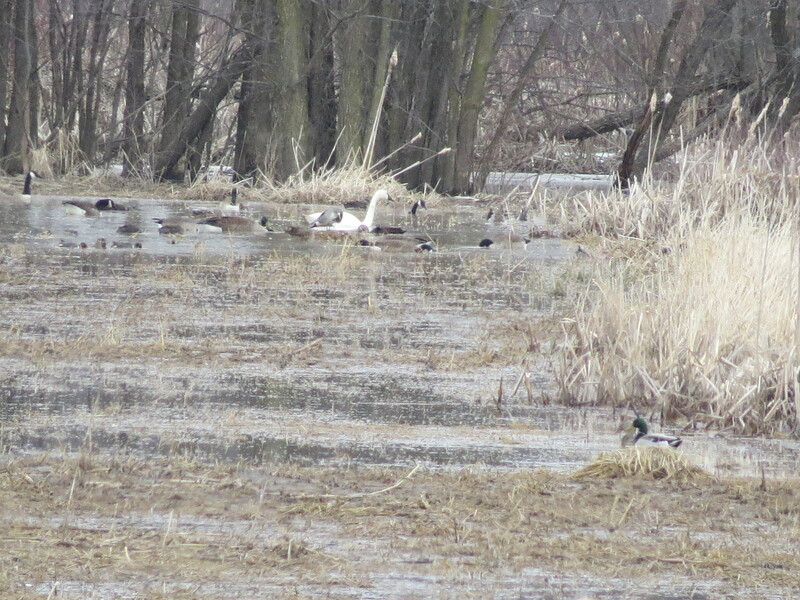 I did locate the Tundra Swan, in a distant farm pond. Would I have squinted at that distant white smudge, if I hadn’t been made aware of the possibility? Probably not (to be honest). Then I saw this guy. 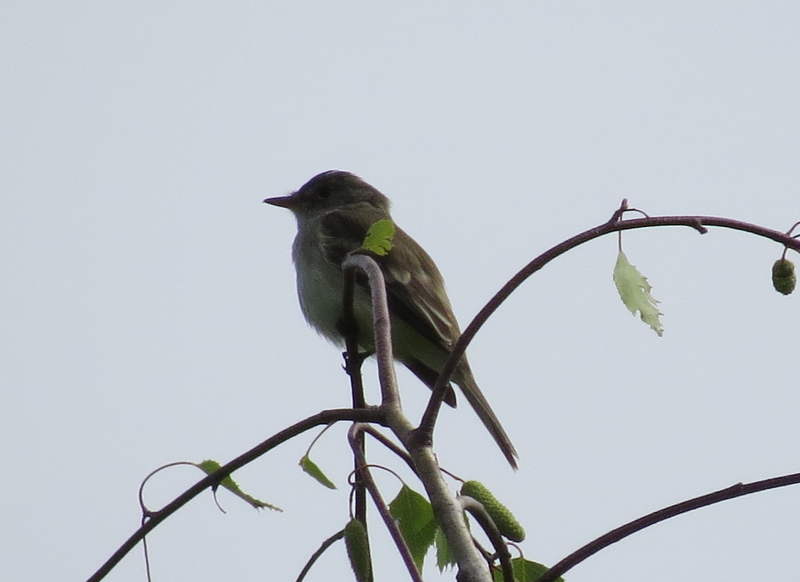 Dark-bellied, and perched on a ridiculously small twig, my first thought was Rough-legged. 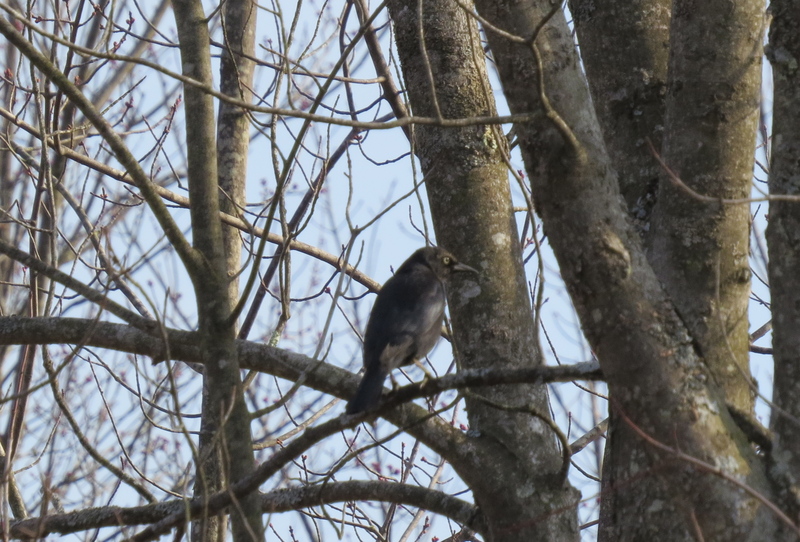 But its head was too dark, so Red-tailed? Well, whatever it was, it was civil enough to stay put while I snapped a dozen pictures, and still hadn’t flown when I left after prolonged scoping. Using traditional resources, I would have kept at it, probably eventually concluding without real satisfaction that it was some weird Redtail and never knowing why. Instead, with a little help from my internet friends, I know a little more. And I know how much more I need to know. *For more on the amazing Ptarmigan, look here! My fall migrant ID, despite cramming, is not strong. Also I have a genius for being where the birds were yesterday, or where they’ll be tomorrow. And I wish I felt more secure in the IDs I do make. The local shorebird migration, such as it is, is pretty much done. Warblers don’t have too long to go, either. 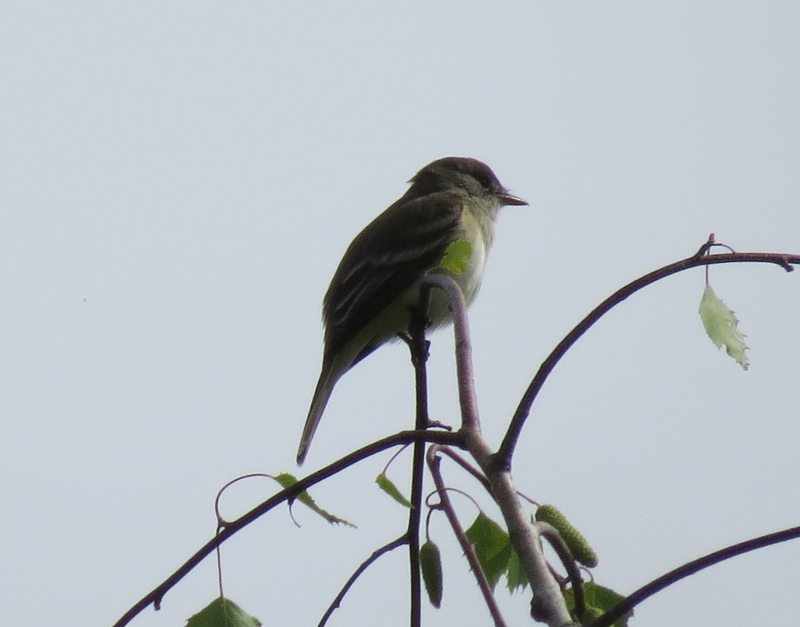 There’s a chance I could pick up maybe 3 warbler species, and Philadelphia Vireo has been seen lately though it keeps evading me. I’m going to see the Short-eared Owls this year if I have to camp out in Fort Edward to do it. No matter how much I twist the map around, the south end of the Great Vly where we heard the King Rail stubbornly persists in being in Ulster County, not Greene, so not Region 8. Grrrr. So, 10 by year end? Maybe, with luck and persistence. I hope to update soon! * Albany, Columbia, Fulton, Greene, Montgomery, Rensselaer, Saratoga, Schenectady, Schoharie, Warren, and Washington Counties. The Common Redpoll invasion continues. After the first crazy surge of 75+ at a time, it’s settled down to a daily breakfast and dinner crowd of between 25 and 35. They can still empty a pound of thistle seed in two days and enjoy sunflower seed in moderation too. A friend reports seeing them forage in a large forsythia bush, and they’ve cleaned off the standing weed heads in my yard. Of course when any bird shows up in hordes like that, a good birder keeps her eyes peeled for the anomaly. 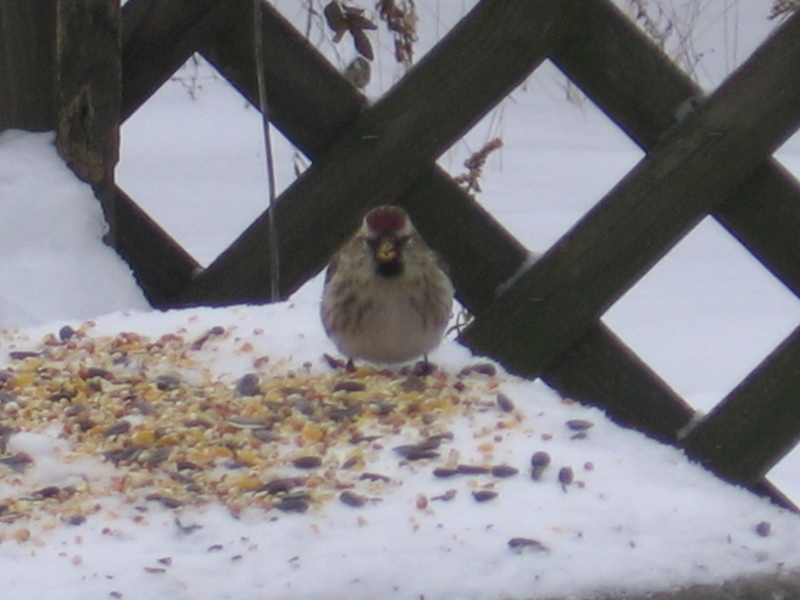 Is it, could it be, a Hoary Redpoll? 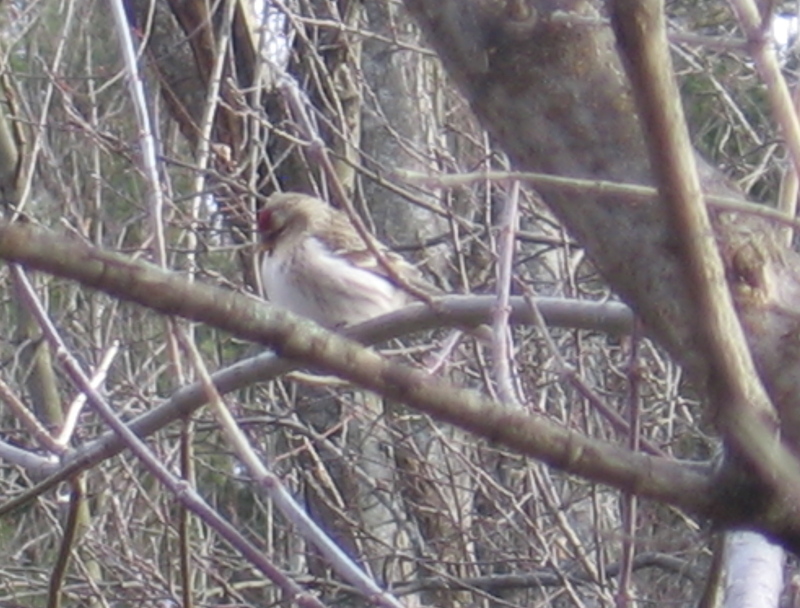 This is a Common Redpoll. Brace yourself for teh cute. And this one — it’s lighter. A bit larger. Beak a bit petite. Less streaky on the sides and undertail. But is it light/large etc enough? We’ve all been racking our brains trying to sort out the incredibly subtle differences between Common and Hoary Redpolls. Sibley has page after insanely detailed page trying to sort them out. Then yesterday I read this article suggesting that we’re all wasting our time. 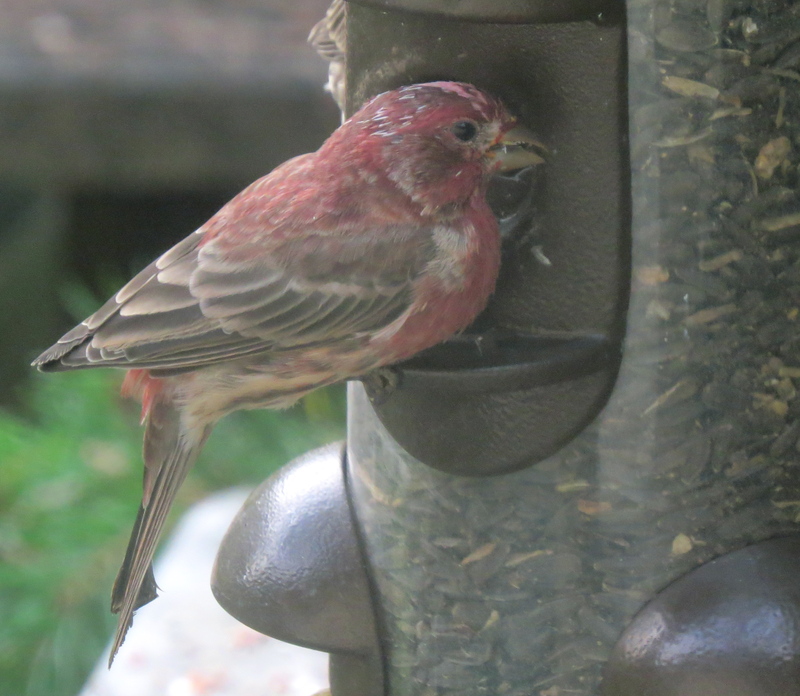 What we’re seeing is Common Redpolls, period, and their plumage is too variable to sort out. The post itself is light in tone though backed up with studies, but there’s some real serious ornithology going on in the comments. So what are the odds of seeing a Hoary Redpoll, if the beast even exists? Pretty good if I travel to the Arctic tundra. Around here? Maybe. Just maybe. After you’ve been birding for a while (she says with a world-weary sigh) you run out of new flashy birds, and at last have to get down to the subtle not to say niggling details. One of the first for many beginners is the difference between Hairy and Downy Woodpeckers. These guys (well, ladies and one guy) were very cooperative in showing off relative body and beak size. 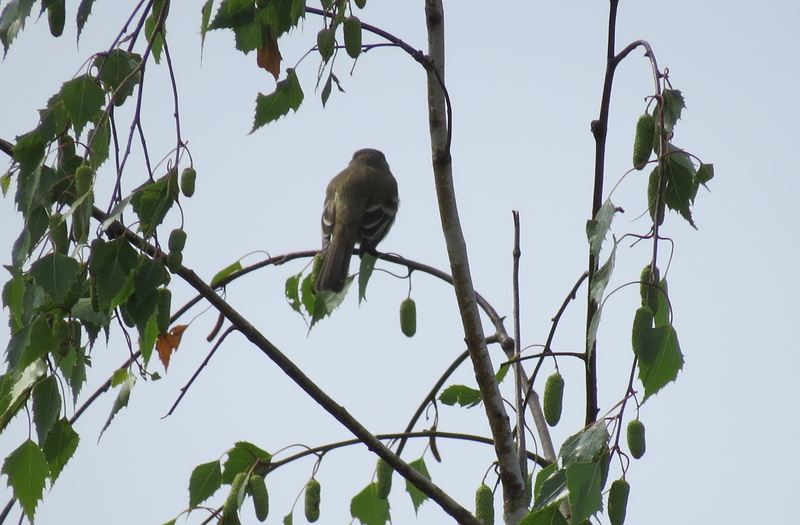 Not so visible here are the plumage cues. Look closely and you can see Downies have dots, as they say — the outer tail feathers have small spots or bars, while Hairys’ are clear white. Also, Downies descend. Their whinny drops down at the end, while Hairies call on a more constant note. I have long maintained* there are only four types of Gull — Great Black-backed, Ring-billed, Laughing, and All The Rest aka Herring. Turns out I’m wrong, and given a push I can acutally ID one more! 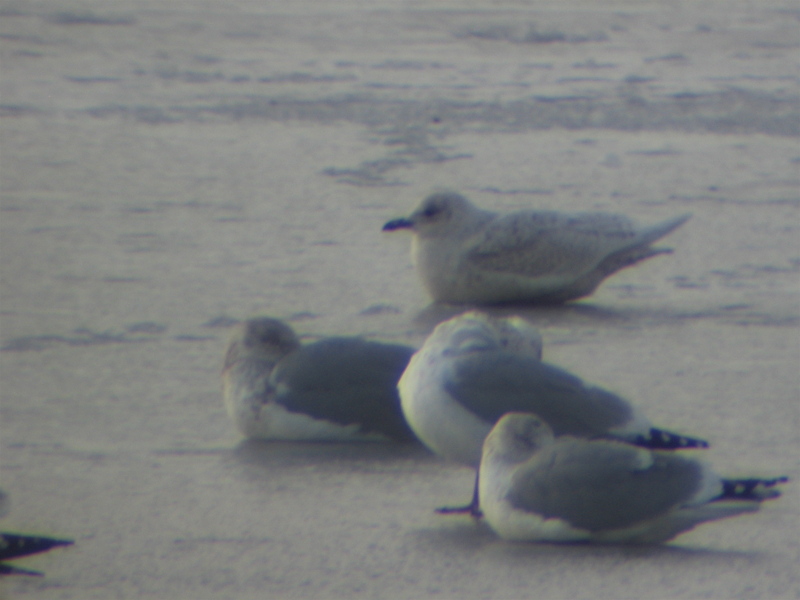 Iceland Gull is a not-too-uncommon visitor in winter. 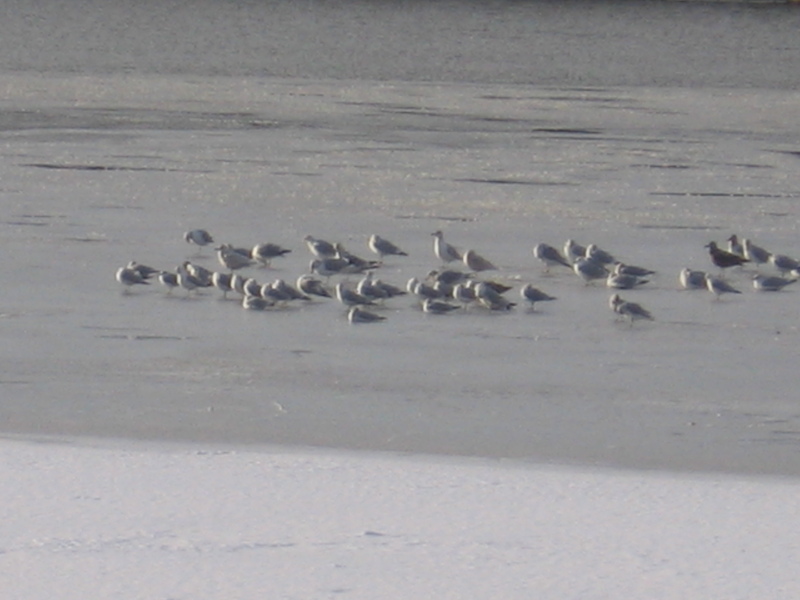 One of our club members had posted pictures of a few hundred gulls and sort of challenged us to pick out the odd bird. After lots of squinting, enlarging, flipping through books and images, and squinting again, it’s true what they say. The bird did suddenly leap out at me and I wondered how I couldn’t see it before. Given the rare combination of ice on the Mohawk and mild temperatures, I ventured out. When I saw the gulls so close to shore I whipped out the binocs and really focused. Can you find it here? Somewhere in here is a pale-winged gull. OK, I can’t either. Try these. 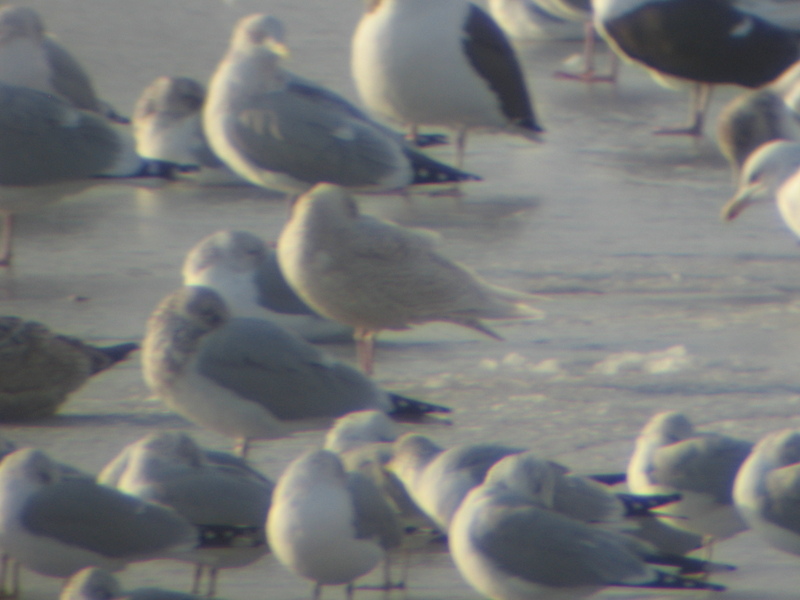 Dark bill, allover light buffy color, no gray ‘mantle’, and no black on the wingtips. Immie Iceland! In all I saw three Iceland Gulls, got a good feel for relative size (between Herring and Ring-billed) and once again had the importance of pay attention driven home. The only thing cooler than a new life bird is finding and IDing the bird myself. With the generous help, always, of more experienced birders. I thought this year I’d catch it, the day when Barn Swallows leave the lines over the farm field to be replaced by Starlings. But once again, they made the switch as I looked away. They were still there Tuesday, and today… gone. Fall migrants are just beginning to trickle back. For the next weeks I will be driving myself mad trying to identify Confusing Fall Warblers and Even More Confusing Fall Shorebirds. This afternoon one of the easiest to ID hopped in the front yard bushes, an American Redstart in its juvenile lemon-drop plumage. Here’s a useful page from my 1966 Golden field guide. This is a good example of why we birders have half a dozen (or more!) 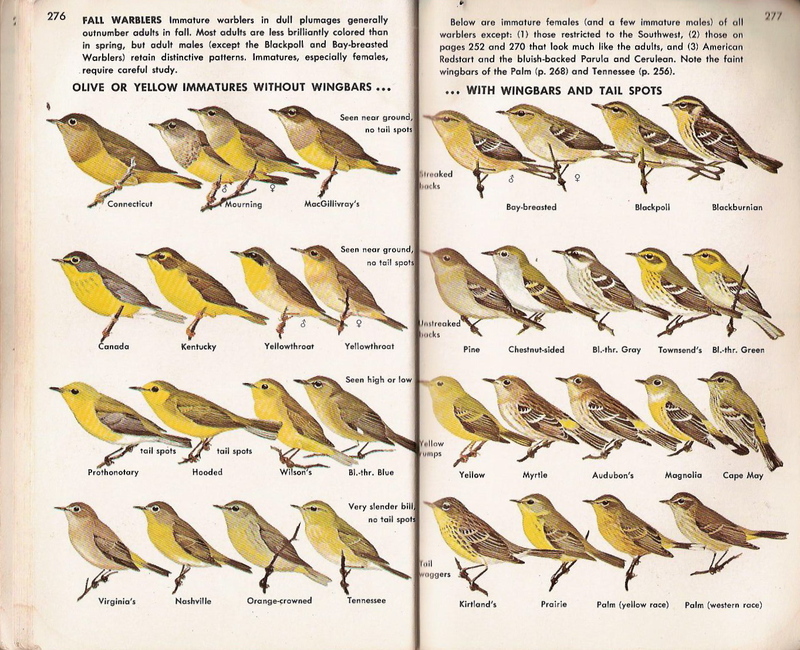 guides — every one arranges things differently, depicts the Ideal Bird subtly differently, or like Golden, shows all the fall warblers and headshots of sparrows in a single location. There is no One Perfect Field Guide! Just look at all those little yallery-greeny creatures! Now reflect that they’re busily foraging for the long trip ahead and darting around at warp speed. You can understand the temptation to give up and call ’em all CFWs. The Thursday Group went down to Papscannee in the beautiful stretch of amazingly rain-free days last week. Some sandpipers, some ducks, aaannndd I’m sorry, all the shorebirds look too alike for me (except for co-operative Dunlins, see later post). We got really nice looks at a Lincoln’s Sparrow, not common around here. Then a flock of little birds with white feathers bordering their tails flew over. Their flight pattern resembled the undulation of Goldfinches, but faster, more erratic and abrupt, then they disappeared into tall grass. American Pipits! They popped out of the grass, circled overhead with a flight call of ‘pip-pit, pip-pit’ and then zoom out of sight again. I could see the white outer tail feathers like a Junco, but a slimmer, lighter-colored bird with a buffy color underlying the streaked breast. Two new species for my life list! But I wasn’t really satisfied with my look at the Pipit. When I add a Life Bird, I like to have a Life Look at it. They never stopped moving and once down, determinedly skulked. So today being the last nice day predicted for some time, I headed back for another try. And there they were! Foraging in the open, about 15 feet from the car window. I had several minutes to study them so close two birds filled my binocs, until a car sped down the dirt road scaring up crows and Pipits (Pipits. I just like the name.) What had seemed to be a small flock turned out to be at least 60 birds hidden in the stubble. Over the next hour I watched as they moved from corn to grass to mud in constant restless action. I tried getting pictures, but… you can guess. So here’s a picture by a pro. 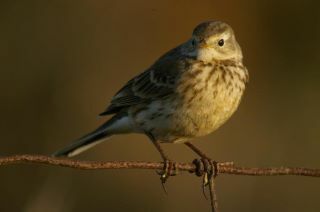 American Pipit ©Clay Taylor, from Swarovski Optik Digiscoping Gallery. Dig those crazy-long nails. Pipit! May was a very birdful month and I’m still catching up on my postings. 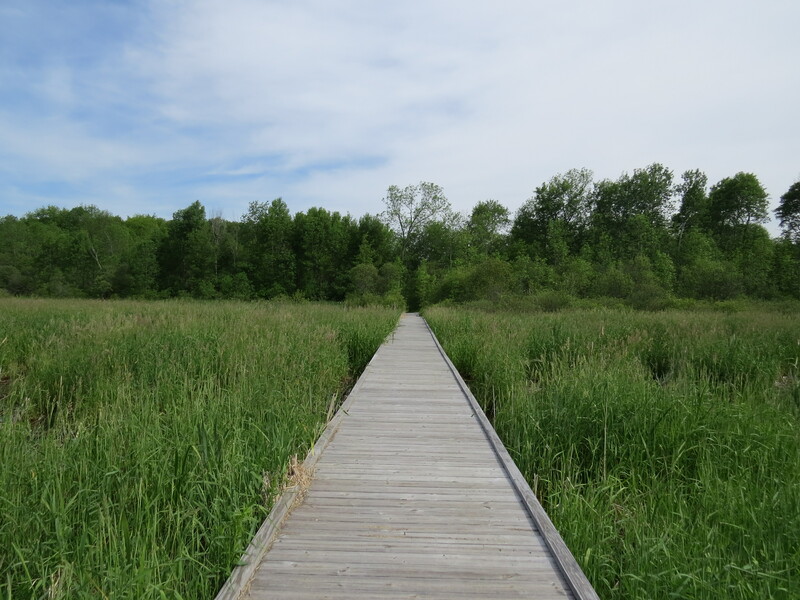 Our big trip was to Montezuma NWR, the wetlands at the north end of Cayuga Lake. Since we had to be at the Ithaca end of the lake anyway, I really wanted to spend some time exploring this amazing habitat. I have a habit of road-birding which (I am told) can be unnerving for my passengers, so I was delighted to see Montezuma was perfect for me. No foot traffic is allowed. Cars must stay on the loop road with plenty of pull-offs for wildlife viewing. Given the unpromising weather, ours was the only car for a while, making it possible to drive while looking through binocs. Not that I would ever do that. We arrived on a drizzly grey morning, so right off we weren’t going to bother with warblering. MNWR has a nesting population of Cerulean Warblers, sky-blue birds that frequent the very tree-tops, and staring straight up into the rain will only get you a stiff neck and wet binoculars. Maybe they’ll still be there in August. A young fox trotted along the road’s edge, stopping to sniff, crunch something up, and leave some messages along the way. As we climbed an observation tower, a robin flew off calling angrily. We had scared her off her nest on the steps. Doesn’t she know the real estate mantra, ‘Location, location, location’? If you’ve never seen your fill of Great Blue Herons, this is the place to come. We saw at least 50 in one marsh. I tried very hard to turn some into Sandhill Cranes, but they wouldn’t cooperate. Other waders included Green Heron, Great Egret, and Glossy Ibis, looking exotic and Egyptian. Lots of assorted ducks and grebes and a pair of Trumpeter Swans, and we had some good long looks at the weird Common Moorhen. They swim like a duck, have a head like a chicken with a wad of gum stuck to the forehead, and long-toed heron feet. They shared the flooded-field habitat with elegant Black Terns. This particular remote wetland was supposed to be our best chance of seeing the cranes. We did see Bank, Barn, and Tree Swallows, and an active Purple Martin colony. 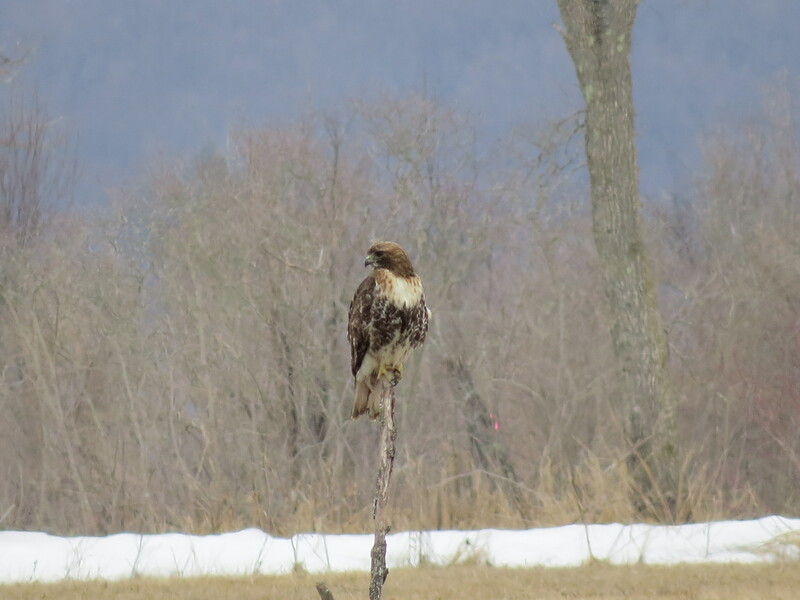 Raptors included Red-tailed Hawks, American Kestrels, Ospreys, Turkey Vultures, and several Harriers including one pale grey male. 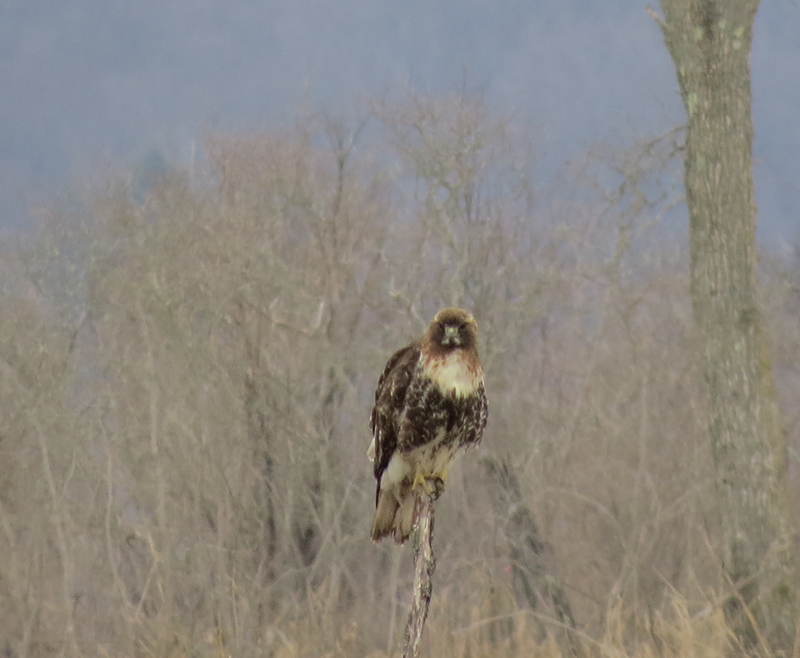 I prefer the old name, Marsh Hawk, or Owl-faced Hawk would be a good name. Oh, did I forget to mention Bald Eagles? Yeah. Soaring overhead, fishing, perched five at a time in trees — yup, we saw a few eagles. Shorebirds — oy. Little peeps, long-legged waders, busy-footed sandpipers, and most of them too far off to comfortably identify. Is it lazy birding to say I enjoyed just observing their lives for a while, their swift foraging, sudden flight, dash and stillness. “In Boston yesterday an ornithologist said significantly, ‘If you held the bird in your hand –;’ but I would rather hold it in my affections.” — H. D. Thoreau. It was getting late in the afternoon; we were tired and as wet-footed as herons. We stopped at one last pull-off which offered a slightly elevated view down into the marshlands, giving us a better idea of the lay of the land. I was kind of discouraged — I really hoped to see a Sandhill Crane. Then suddenly a huge gray bird, bigger than a heron, flying with its neck extended, trumpeting its wild cry. I grabbed Bill’s arm, shouting, “There it is! There it is!” How exciting for my target bird to be the very last bird of the day! We spent the night at the Hotel Clarence, and if you’re visiting the Seneca Falls/Montezuma area, I highly recommend it. It has vastly more character than the chain motels, for much the same price. And their cable included BBCAmerica, so we got to watch Doctor Who! It poured overnight and was still raining lightly in the morning, and we did have a deadline for arriving at Cornell, so we did one more quick loop around, stopping to watch carp struggling to sneak from the barge canal into the waters of the refuge. Baffles on the sluices letting water flow from the Refuge to the canal stop most of the fish, though a few get through and are the source of startling leaps and splashes in the marsh. I filmed the carp-et of fish (thanks Caleb!). And then we drove down the east coast of the lake through rain and dense fog, picked up our young man and his belongings, and headed home. Hmmm, it’ll be late August when we have to bring him back… migration time! An unexpected side benefit of getting better at birdsong: I can walk at a respectable exercise clip while still doing ID. “Yellow warbler,” point right. “Goldfinch,” overhead. “Blue-winged, ovenbird, veery!” to the left.